With only a week left of 2012, my boyfriend and I were lucky enough to take 3 weeks out to travel around Mexico, Guatemala and Belize with two of our good friends! Suffice to say, with a trip like this, 2012 ended very well and 2013 got off to a great start! We flew straight to Mexico City where we had a quick overnight stop-off in the Ramada Aeropuerto Hotel before flying to Cancun the next day. From here we took an ADO bus 2 hours to Playa Del Carmen which is in the Yucatan Peninsula. We made the decision not to stop off in Cancun as it would be too touristy but alas, Playa Del Carmen was much the same! It was however the perfect start to our trip. We then moved onto Isla Mujeres which is a tiny island off the top point of Mexico. Beaches with perfect white sand and lovely food! 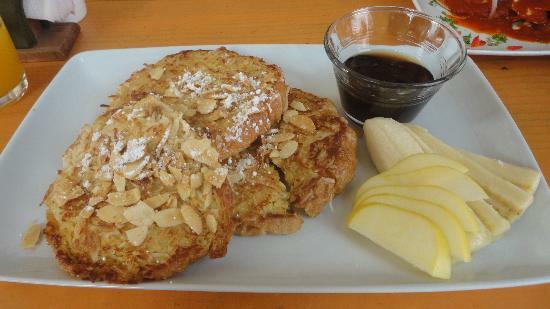 If you are ever there and fancy an amazing breakfast, stop off at the Mango Cafe for a Caribbean cook-up of coconut French toast with bananas and maple syrup! After a VERY lazy start to the holiday, we headed back to Cancun airport and took a flight to Tuxtla where we met friends from London. Another quick taxi journey found us in San Cristobal De Las Casas in Chiapas, which was one of our favourite places! We stayed at Casa Mexicana Hotel http://www.hotelcasamexicana.com which was beautifully restored and perfectly located. We set off to explore the little cobbled streets of colourful buildings set in a highland valley. San Cristobel is full of gorgeous stores selling hand-woven goods where we all picked up some pieces for our houses back in London, to remind us of our journey in years to come! We decided we couldn’t look at another taco for a few days and found a tiny Thai place, Comida. There are only 3 tables and one lovely lady cooking who had moved to San Cristobel from Bangkok. The food was incredibly authentic and delicious! The next day we took a day trip to Sumidero Canyon which was breathtaking! We were lucky enough to see spider monkeys swinging from the trees and crocodiles lounging by the side of the lake. We also stopped at the little town, Chiapa de Corzo where we had delicious street food and wandered around the craft markets. The next day we prepared ourselves for the long 8 hour bus journey (which turned into 10) in a tiny overfilled shuttle bus from San Christobel to Lago De Atitlan. As we picked up people from their hotels, we realised that there was a three day psychedelic trace festival, Cosmic Convergence, over NYE just near where we were heading! Not only was our attire very different from all of the other travellers on our bus (we looked very prim with our freshly washed hair, holiday outfits and wheelie suitcases), we were also subjected to 10 hours of “the meaning of life” chat! The bus journey saw us cross the border into Guatemala and arrive into the tiny lake town of Lago De Atitlan in the early evening. The lake is vast and gorgeous with the writer John L Stephens describing it as “the most magnificent spectacle we ever saw”. Driving into the valley is a pretty magical site. We ate delicious food at Sunset Cafe, canoed on the lake and shopped for the most beautiful handicrafts and jewellery in the street market. After our bus journey 2 days before, we decided to treat ourselves to a private shuttle bus from Lago De Atitlan to our next stop, Semuc champey. Although this was much more comfortable, it also ended up been longer than expected at 8 hours. All the guide books say not to travel at night (which we politely ignored) and as a result we did have a fear that armed bandits would hijack our car! The next day we visited the waterfalls that Semuc champey is famous for and found that our scary bus journey and lack of comfort were worth it. The falls are stunning and we spent the day hiking, swimming, caving by candle light, using the smooth rocks as waterslides and tubing. Most of which (as I am very unadventurous) was terrifying but completely worth it! Very early the next morning, after a rude awakening of the coldest shower imaginable, we headed to our New Years Eve destination, Livingston. This is quite a strange little place on the border of Guatemala and Honduras. It is very unlike anywhere else we saw in Guatemala but well worth a visit! After alot of travelling, it was time to cross another border and head to Belize. We took a crazy boat journey to the border then a bus to Belize City. 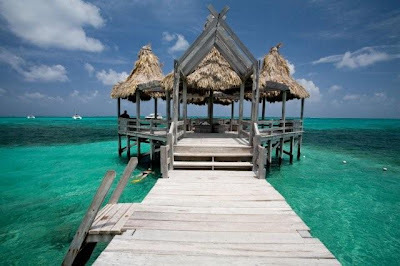 From here we took another boat to the gorgeous Ambergris Caye where we stayed for 5 nights. This was one of our favourite places! We stayed at Mata Rocks http://www.matarocks.com/ where every morning we would eat fresh fruit and read on our private stretch of beach, before riding our bikes into the town and feasting on amazing food! We ate at Wild Mangos, Hidden Treasure, Rendezvous Restaurant and Winery and Victoria House – all delicious! On one of the days, we took a half day trip to go snorkelling which was one of our favourite experiences! The marine life was phenomenal and we swam with vast schools of colourful fish, huge rainbow parrot fish, stingrays AND sharks! The guide assured me that the sharks “probably” don’t bite which was a little intimidating but an amazing experience! Feeling very relaxed after five days, we took a boat to Chetumal and a flight back to Mexico City where we had 2 days to explore. I knew as soon as we were driving from the airport to the hotel that I loved Mexico City! We stayed at Downtown in Centro Historico http://www.downtownmexico.com/ which was the perfect hotel in terms of location and was gorgeous! 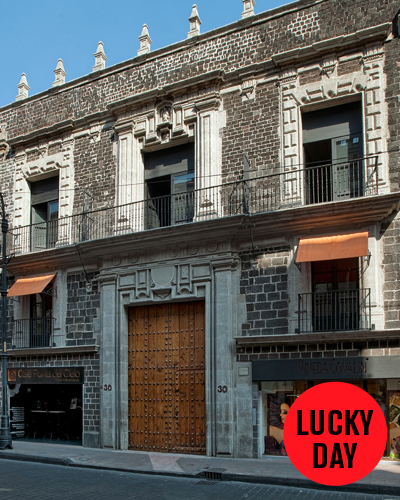 A couple of other hotels I would recommend are Condesa DF and Brick Hotel. The first day we spent exploring the area we were staying in and saw the ruins of Templo Mayor. We then made our way to the ultra hip area of Roma to explore the open, leafy streets with little boutiques and ate a tasty lunch at Delirio. That night we managed to score tickets to the wrestling at Arena Mexico which is one of Mexico’s most popular sports! It was pretty comical and definitely something to do if you find yourself in Mexico! They go CRAZY for it! On our second day, we headed to the cool area of Condesa and Museo National De Anthropologia which were both fab! If we had more time, we would have also made our way to Xochimilco, the floating gardens. It’s supposed to be a nice place to take a picnic onto the gondolas while floating down the canals. You could follow on with dinner at Izote and drinks at Felix Bar. Another time though, and an excuse to come back! An amazing adventure that we will never forgot! The biggest question is, where to next!? !